These Crock Pot Peanut Butter Caramel Brownies with a scoop of vanilla ice cream are the ultimate crock pot dessert recipe! 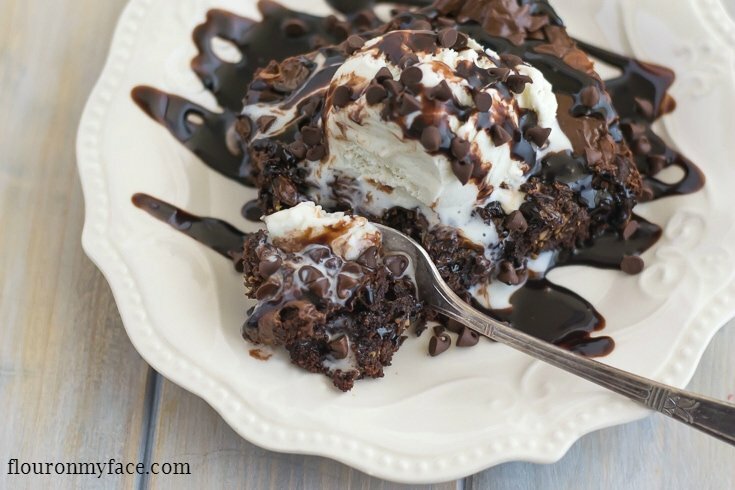 Take a box of brownie mix and turn it into the ultimate crock pot dessert recipe by adding a few of my favorite ingredients. Peanut butter, chocolate chips and caramel bits. Then serve it all up with a scoop of vanilla ice cream. Take a bite……sigh in pleasure. Don’t worry it’s okay. We must have a chocolate fix every once and awhile. Adding some peanut butter and caramel bits….. well it’s heaven of course. What goes better with warm chocolatey brownies? Peanut Butter and caramel does of course. What goes better with warm chocolatey brownies? Peanut Butter and caramel does of course. 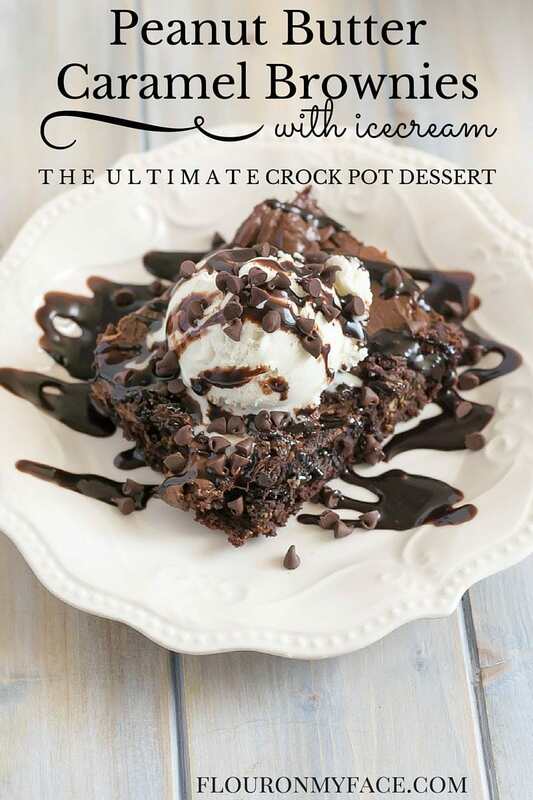 Enjoy this easy crock pot brownie recipe anytime you are craving something sweet and decadent! 1 box brownie mix and ingredients to make. Spray the bottom of a large crock pot like the (affiliate link) new crock pot casserole slow cooker. Mix the brownie mix with 1/4 cup peanut butter following the directions on the box. Spread the brownie mix into the bottom of the crock pot. Place dollops of the remaining peanut butter all over the top of the brownie mix. With a sharp knife swirl the peanut butter across the top of the brownie mix. Place a double layer of paper towels over the top of the crock pot. Place the cover on top of the paper towels. Cook on high for 1 1/2 to 2 hours (see my above notes on cooking time). Turn the crock pot off and sprinkle the caramel bits and the chocolate chips over the top of the hot brownie. Replace the lid for about 10 minutes. After ten minutes remove the lid and spread the melted caramel and chocolate chips over the top of the brownie. Allow to cool about 20 minutes before serving. 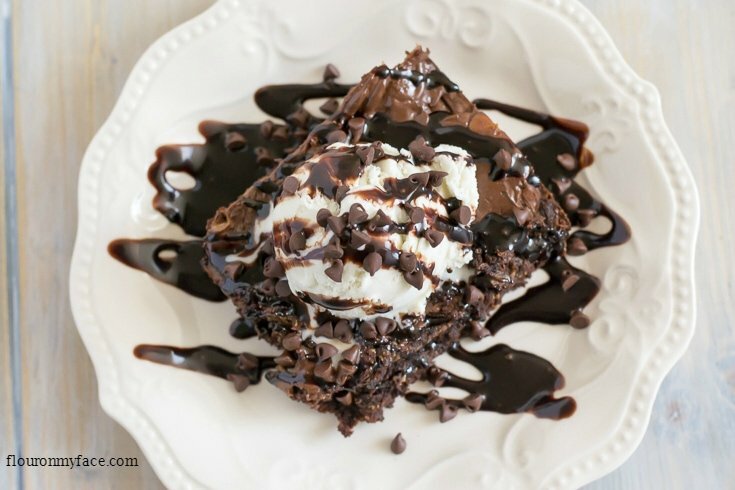 Serve warm with a scoop of vanilla ice cream, a drizzle of chocolate syrup and some chocolate chips. Once of life’s pleasure is chocolate. Make life easier by making these Crock Pot Peanut Butter Caramel Brownies in the slow cooker. You won’t be sorry! Spray the bottom of a large crock pot like the new crock pot casserole slow cooker. Chocolate, peanut butter, and caramel not your thing? 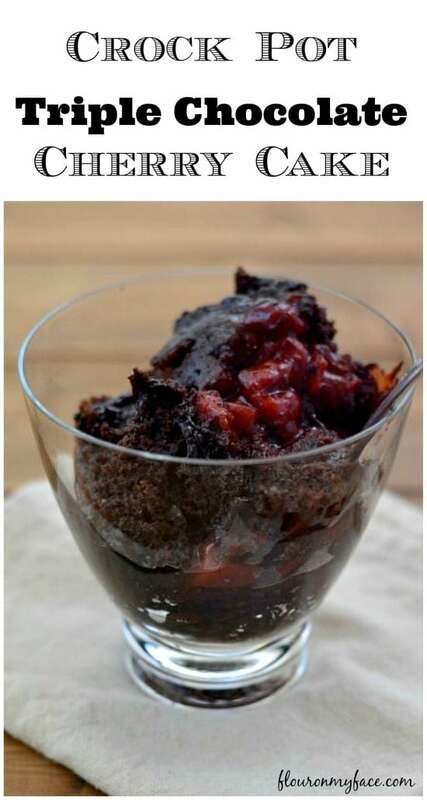 How about this Crock Pot Triple Chocolate Cherry Cake recipe instead? Sign up for the Flour On My Face Newsletter and get a new crock pot recipe delivered straight to your email every Friday. For more Flour On My Face Crock Pot recipes head over to my recipe page where you will find 90+ crock pot recipes that I have shared. My lips are smacking together. Love this! Wow that pic looks amazing! Yum Thanks for the recipe! Thanks for linking up to Merry Monday! Pinned & Sharing on FB! Have a great week! Sow this looks so good, I am drooling here. Nice to have it made in the crock pot. Oh my word, these look rich and inviting! Yummy! Thanks for linking up with Delicious Dishes Recipe Party!